Third in a series of critiques of the Minnesota Department of Commerce’s final environmental impact statement (EIS) on Enbridge Line 3, a proposal to expand and reroute a tar sands crude oil pipeline through northern Minnesota. Commerce is taking public comments on the adequacy of the EIS until 4:30 p.m. Oct. 2. To learn how to submit comments, click here. For the third installment, let’s look at the opaque and slanted language of the environmental impact statement (EIS) and how its exclusively technical bent prevents citizens from effectively engaging the debate. The EIS is inadequate in that it provides a flood of data, but very little analysis that pulls it together in a meaningful way. Yes, the detailed technical analysis is necessary, but so are plain English explanations of what it means. Typically, these kinds of reports includes introductions and summaries that help citizens understand the basic context. These are notably absent from the report. It works to Enbridge’s advantage to have an EIS written in a way that only experts understand. Compounding the problem, the Public Utilities Commission (PUC) has started the last round of public hearings on Enbridge Line 3 before it has determined whether the EIS is adequate. The EIS is a critical source of public information. During the transport of crude oil by pipeline and by the alternative modes of rail and truck transportation, unplanned events may occur that can result in a release of crude oil. … the potential for unanticipated releases and the potential consequences of such releases must be considered in this Environmental Impact Statement. “Unplanned events” and “unanticipated releases” are euphemisms for a pipeline rupture or train derailment; “potential consequences” is a euphemism for environmental damage. This language not only fails to paint the picture of what is going on, it makes it sound like pipeline spills are something that just happen, something outside of Enbridge’s control. It’s blame-free language. On page 10-18, the EIS has a table titled: “Minnesota Crude Oil Unintentional Spill Incidents 2002-2016.” Among the causes listed for spills are “”incorrect operation”, “corrosion failure”, and “excavation damage.” Those should be things that can be fixed with better training and better materials. Why put the emphasis on “unintentional”? They might not be intentional, but they could be avoided. Although the probability of a large or major oil release at any specific location is extremely low, the probability of a release of some type along the entire pipeline during its lifetime is not low. This is another tortured sentence with odd word choices. Saying the possibility of a rupture in any one spot along the pipeline is “extremely low” is no comfort and not the issue. 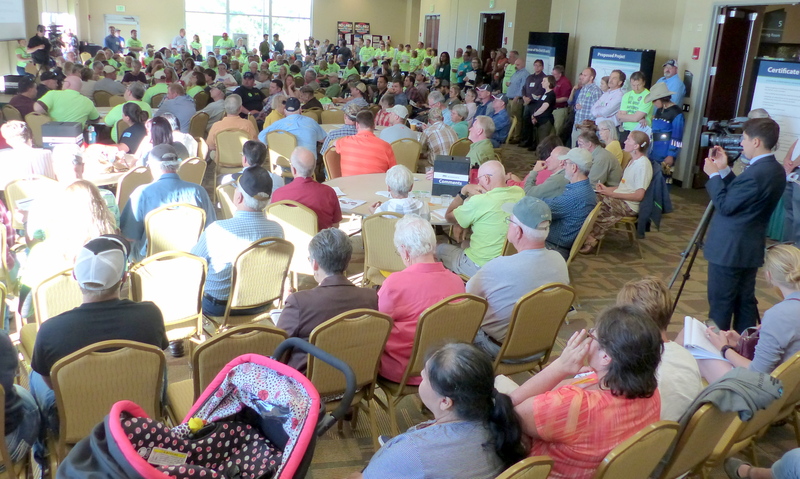 People want to know if the pipeline is going to spill toxic crude oil somewhere. Northern Minnesota is full of interconnected lakes and rivers. Every part of the pipeline is part of a watershed and a rupture would have consequences well beyond the rupture site. Why is Commerce using such opaque language that fails to clearly state the risks? Chapter 10 is 176 pages long, and nowhere in the chapter after the first sentence does the EIS make an effort to summarize the information in an understandable way. (Read it, you’ll see.) Here’s my shot at writing a 700-word chapter summary that would have been useful. This chapter analyzes potential pipeline spills and ruptures, and the potential environmental impacts. It provides historical details on pipeline spills in Minnesota and the United States. U.S. inland pipeline spills were generally decreasing from the 1960s to the early 2000s, but with the U.S. energy boom we are back to spill levels we have not seen since the late 1960s. However, the average crude oil spill size per amount oil transported by pipeline has been decreasing. From 2006-2015, there were seven U.S. crude oil spills between 10,000 barrels and 90,000 barrels. (At 42 gallons per barrel, that’s between 420,000 gallons to 3.78 million gallons.) Enbridge is responsible for the two largest inland crude oil spills in U.S. history, one near in Grand Rapids, Minn., in 1991 and one in the Kalamazoo River in 2010. Enbridge says it has new procedures in place to improve safety and response. Enbridge Line 3 was built in the 1960s, and is old an failing. This analysis looks at the environmental impacts of leaving the old pipeline in the ground, and the risks of running a new and larger pipeline along a new route. These are important questions. The new route crosses the Mississippi River twice, including once at the headwaters. It also runs near lakes, streams, and wild rice beds. This chapter models potential crude oil spills at seven different sites along the pipeline and assesses the various environmental impacts on lakes, rivers, ground water, wetlands, air quality, shorelines, vegetation, fish, birds, humans, and more. The EIS evaluates impact areas in different ways. For one, it looks at impacts on lands and water within 2,500 feet (less than half a mile) of the proposed pipeline route. It also looks at the impact area 10 miles downstream from the pipeline. 5,775 acres of unusually sensitive environmental areas. Here are some of the impacts that would happen if a spill happened in a sensitive environmental areas (also called HCA’s or high consequence areas). A crude spill could affect wetland resources directly through contamination with oil or indirectly from response vehicles, equipment, and operations that could affect wetland hydrology, vegetation, and soils. Crude oil exposure can result in adverse effects on fish and aquatic plants, both from crude that floats on the surface the crude that sinks to the bottom.Fish that have been exposed to oil may suffer from changes in heart and respiratory rate, enlarged livers, reduced growth, fin erosion, and deformities. One could quibble about which data to include or the ordering of information. Surely my draft could be improved, but it’s a lot better than what Commerce offered its readers. The EIS never pulls together the various environmental impacts in one spot; they are included here and there throughout the 176 page chapter as part of the technical narrative. Was Commerce staff under too much time pressure to write more clearly? Did staff consider concerned citizens as part of its audience? If not, why not? Again, I understand the need for a technical analysis. But there is no excuse for not including understandable interpretation. On that ground alone, this EIS is inadequate.